CORRECTION: An earlier version of this post misstated one of North Korea's unique scoring rules. Scores within the last three seconds, not minutes, count for eight points. The corrected version is below. 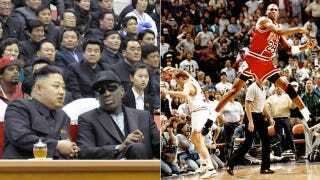 As we (re)learned last week, North Korea has its own way of scoring basketball games. Normally when North Korea does something differently from the rest of the world, it's horrible and ends up with thousands starving. But this one is kind of funny! Dunks count for three points. So called "three-pointers" that don't touch the rim are worth four points. Baskets within the last three seconds of the game count for eight points. You lose a point for missed free throws. It should be obvious how insane and game-altering these scoring changes are, particularly the last two. Rule No. 4 makes most players susceptible to hack-a-shaq tactics, and smart teams would foul as much as their bench depth would allow. The combination of Rules 3 and 4 would make it pretty much inexcusable not to foul in the last three seconds of a game. I'm not here to talk strategy though, I'm here to rewatch and score some classic NBA games. North Korean style. There is some vagueness to these rules, so I made some assumptions. First, I assumed that these "bonuses" did not stack: in the last three seconds a layup, a dunk, or a three would all be worth eight points. I also assumed that the spirit of Rule No. 2 would credit essentially perfect three-pointers (like the one Steph Curry unleashed against the Knicks last week) that kiss the back of the rim. An already close matchup turns heartbreaking for the Pistons, as Joe Dumars nails a meaningless eight-pointer at the buzzer with the Pistons down by nine. The Celtics wisely did not risk the nine-point play by contesting. Larry Bird had a legendary game with 38 points (37 standard scoring), while Dumars added 35 points (35 standard) in the loss. The Pistons actually led Boston in North Korean bonus points 9 to 4, but missed 11 free throws to the Celtics eight. And that, right there, was the game. In real life, Michael Jordan put up 44 points in one of the best games of his early career, but his score in the last three seconds (+6 points over the standard two), three-point swish in the third (+1 point), and four missed free throws (-4 points) brought his North Korean total to 47. No dunks for Air Jordan this game, but he did have one spectacularly missed slam that went flying into the stands. By this scoring, the Bulls were down by seven when Jordan got the ball. While the Cavs obviously should have fouled, this would make "The Shot" the greatest thing that ever happened. I chose to ignore the fact that this game wouldn't have gone into overtime with North Korean scoring, because that would be boring and those last five minutes are what make it a classic. Finally, the winners switch! Neither team netted a shot in the last three seconds (regular or overtime), but the Pacers added three dunks (+3), eight swishes (+8), and missed only four free throws (-4) to add seven bonus points, while the Lakers gained just one thanks to ten missed free throws. In real life Reggie Miller missed the game-winner, but in North Korean scoring, his five swishes, four in the fourth quarter and overtime, tilted the game towards Indiana.